Tablature is a special music notation for string instruments. It is comprised of six horizontal lines (for six string instruments, four lines for four string instruments, etc.). Numbers are placed on the lines to indicated what fret you note. See example of playing an E chord one note at a time. Starting with the bass E string. Here I am with grandson Billy and brother Gary (what the devil is he doing?) 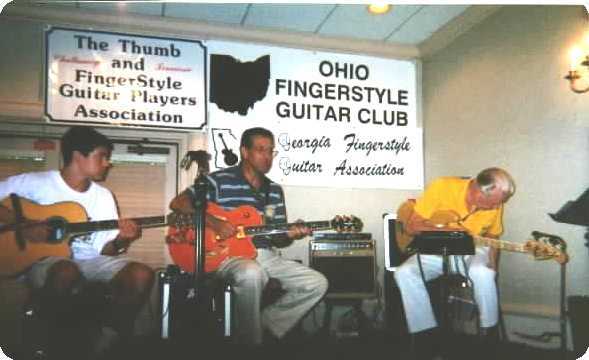 playing in the Belmont Room of the Music City Sheraton during the 2002 CAAS convention in Nashville. I have over a hundred tunes I have tablature for. For a complete list and a sample tune on tab, send a SASE to Billy Denham, 9915 Blue Springs Road, Harrison, TN. 37341.